Almost every individual hates being wrong. We hate making a mistake and not being perfect. However, we can't let every mistake we make get us down. 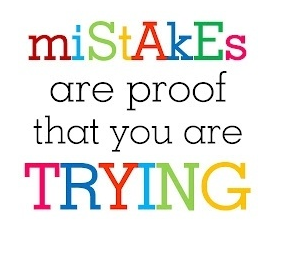 As this quote reminds us, mistakes are simply proof that we are trying. It shows that we are putting forth our time and our effort to make it work. Don't let one little mistake ruin your entire day. Just remember that it is proof that you are trying and doing your best.